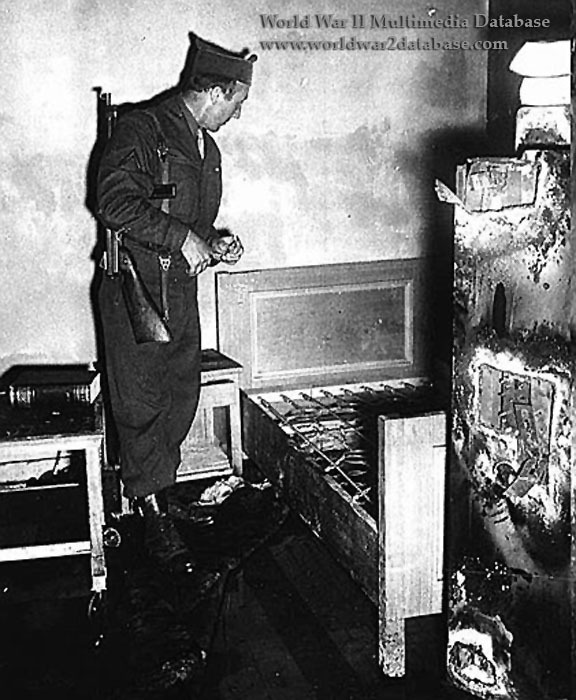 Private First Class Richard V. Blust (March 14, 1912 - June 26, 2006) examines the bed believed to be used by Führer und Reichskanzler ("Leader and Reich Chancellor") Adolf Hitler from January 16, 1945 to his death on April 30, 1945. A safe, which was cracked open by the Soviet engineers who first entered the bunker, is at the foot of the bed. Hitler's bedroom was behind his private conference room, off the main conference room of the bunker. The exact layout of the bunker is disputed. Note book on the table behind Blust; the bunker was stocked with furniture, books and fine art from the Chancellery above. He is standing on cushions because of the water in the bunker. Blust was escorting the press corps from the Potsdam Conference to examine the bunker. Soviet soldiers were also present during this visit. The first western correspondents to visit the bunker arrived with the American forces in Berlin on July 3, 1945. Prior to arriving in Berlin, William W. Vandivert (August 16, 1912 - December 1, 1989) and Percival "Percy" R. Knauth (June 17, 1914 - January 15, 1995) from TIME/LIFE, with Jack M. Fleischer (November 10, 1914 - October 5, 2006) from United Press and Pierre J. Huss (May 1, 1901 - March 22, 1966) of the International News Service, interviewed SS-Obersturmbannfuhrer (Lieutenant Colonel) Erich Kempka (September 16, 1910 - January 24, 1975). On June 20, 1975, Kempka was captured by U.S. troops at Berchtesgaden and the press interviewed him there. He drew a map of the bunker for the four correspondents and told them that Hitler married Eva Braun and then committed suicide by pistol and cyanide. Arriving at the bunker on July 3 ahead of the rest of the press corps by forty minutes, Vandivert took photos while the other three correspondents navigated the Vorbunker ("Forward bunker") into the Fuhrerbunker by candlelight and flashlight. The bunker was partially flooded and few lights functioned. At least one Soviet Red Army soldier accompanied them and warned them that mines in the Chancellery garden were still active. The reporters located the couch that Hitler and Braun sat on when they committed suicide. They found bloodstains and believed Kempka's story. Knauth later wrote, "I went down into the Fuhrer's bunker, descending the many-flights of stairs until the light of day had vanished far above. Rubble littered the steps—scraps of paper, gas masks, unexploded cartridges, moldering German uniforms—making the footing uncertain. A cold smell of dampness and long-dead fire came up from the blackness. At the bottom, the flashlight picked out a small steel door, swung ajar. This was a guardroom, with double-decker bunks on which lay tumbled mattresses and junk of all kinds. Beyond it was the underground apartment where the Fuhrer and his closest advisers had spent the last hours before Berlin fell. Two other correspondents. Jack Fleischer and Pierre Huss, had a map of the bunker given them by Kempka. With its aid, we found our way through the rubble-littered rooms. The large anteroom adjoining the guardroom had been blackened by fire. Pictures charred paper-thin hung on the walls, ready to collapse into nothingness at a breath. The walls were black-flaked and peeling, and tumbled everywhere were pieces of charred furniture. There was water on the floor two inches deep, and carpets squashed soddenly underfoot as we picked our way through. A right turn from the anteroom brought us into a smaller room, likewise burned out, and then into the Fuhrer's room itself, according to the map. No fire had burned here. Against the wall opposite the entrance stood a sofa, deep-cushioned in a frame of light-colored wood. Here, if Kempka had spoken the truth, Adolf Hitler and his bride of forty-eight hours, had shot themselves. We bent close to look, too excited to say a word. The flashlight beams traveled jerkily up and down the brocade upholstery. According to Kempka, Eva had sat in the right-hand corner of the sofa and shot herself through the heart; Hitler, sitting next to her, had shot himself in the temple, his body slumping forward on his knees. We held the lights close to the corner. There were unmistakable bloodstains on the light-colored wooden arm. Blood had flowed down and coagulated in little rivulets in the comer. There was blood on the outside too, a broad trickle that had soaked the upholstery and dripped onto the floor." Huss wrote in a story dated July 4, "There were not only bloodstains in Hitler's room but in the adjoining bunkers. The chambers were blackened from gasoline fed flames where subsequently Propaganda Minister Goebbels and his wife are said to have committed suicide. Outside in the shell-pitted garden, fifteen paces from the bunker exit, there Is a shallow trench. It was here, according to Kempka's description that he and six other Nazis watched the gasoline-soaked bodies of Hitler and Eva. burning while Russian shells screamed overhead." Shortly, other reporters, including J. Emlyn Williams of the Christian Science Monitor, Louis P. Lochner (February 22, 1887 - January 8, 1975) and Daniel De Luce (June 8, 1911 - January 29, 2002) of the Associated Press, entered Chancellery and some entered the bunker. Lochner found the evidence inconclusive, but it's unclear if he was familiar with Kempka's story or even if he was prepared to enter the bunker with candles or a flashlight. The first group of reporters had their stories published in early July. By the time of the Potsdam Conference, the Fuhrerbunker ("Leader's Bunker") was quite a tourist destination for visiting press and politicians. United Kingdom Prime Minister Winston Churchill visited the bunker on July 24, 1945. United Kingdom Auxiliary Territorial Service (ATS) female soldiers were invited to tour the Chancellery around the same date. Acme News Service photographer Charles Haacker accessed the bunker during that trip, and this photograph was taken at that time. Numerous Allied generals and politicians visited the bunker throughout the summer and fall of 1945. The Soviets attempted to destroy the bunker in 1947 but only destroyed the surface structures. In 1959 a more complete deconstruction left the underground structures intact but removed all the debris. The bunker area was in no man's land by the Berlin Wall until 1989. The underground bunkers were extensively, but not completely, removed in 1990. The area is an apartment complex today. A simple marker denotes the history of the area.